Optimism for US dollar fades again – US dollar net long bets slipped to $6.8 billion from $7.4 billion against the major currencies in the previous week, according to the report of the Commodity Futures Trading Commission (CFTC) covering data up to March 8. The February jobs report painted a mixed picture of the labor market. The 242 thousand increase in February nonfarm payrolls exceeded considerably the expected 190 thousand increase in jobs, indicating continued improvement in labor market. At the same time the average hourly earnings fell 0.1% in February, resulting in a decline from 2.5% year-on-year gain in January to 2.2% rise in February. The strength of the labor market together with signs of building inflationary expectations in the form of rising core consumer prices have been cited repeatedly by the Federal Reserve as the two main indicators policy makers use in deciding whether to tighten the monetary policy or not. While core inflation rate has been rising steadily and reached 2.2% in January after crossing above the Fed’s target level of 2% in December, the absence of clear inflationary trend in wages and, moreover, falling wages make it not likely that the Fed may raise interest rates at its coming meeting of March 15-16. The dollar bullish bets were reduced accordingly as traders adjusted their expectations for a rate hike. As is evident from the Sentiment table, sentiment improved for all major currencies except for the British Pound and euro. 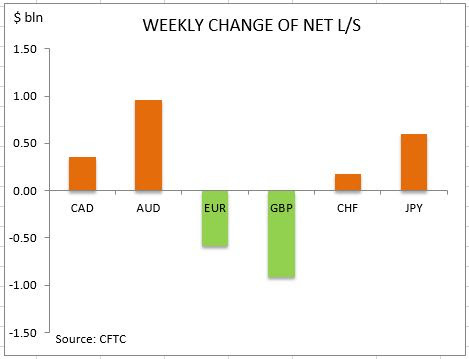 And while the Japanese yen and Australian dollar are still the two currencies held net long against the US dollar the Swiss franc looks poised to join them if the recent pattern of rising bullish bets continues. The deterioration in euro sentiment continued at a moderate pace ahead of the European Central Bank March 10 meeting. It was widely expected that ECB would provide more stimulus measures but investors were wary additional easing might fall short of expectations. The net short position in euro increased by $0.5bn to $9.8bn. 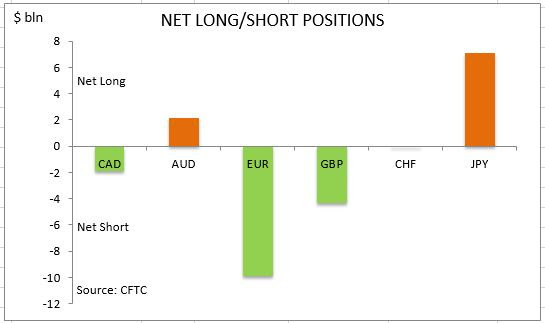 The euro net short bets rose as investors increased the gross short positions by 3566 contracts and added longs by 200. The uncertainty about global growth prospects spurred high demand for safe haven yen. The net long position in Japanese yen kept rising at the previous week’s pace of $0.6bn reaching an eight year high at $7.1bn. Investors reduced both the gross longs and shorts by 203 and 4911 contracts respectively. The political uncertainty surrounding future membership of Britain in the European Union continued to weigh on British Pound . The sentiment deteriorated with the net short position widening by $0.9bn to $4.3bn. 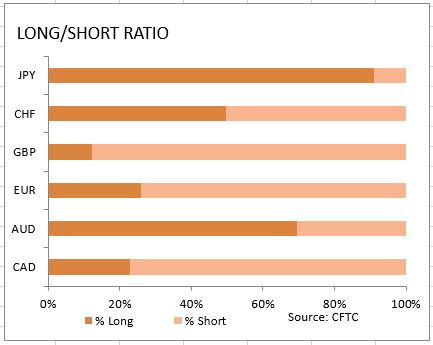 Investors cut both the gross longs and shorts. The sentiment continued to improve for the Canadian dollar with the net short position narrowing by $0.3bn to $1.9bn ahead of Bank of Canada interest rate decision. Investors cut both the gross shorts and the gross longs. The bullish sentiment toward the Australian dollar continued to strengthen in the wake of the Reserve Bank of Australia’s decision in previous week to leave the interest rate at 2%. The weekly pace of increase in net long position in Australian dollar almost doubled to $0.9bn, with net long position hitting $2.1bn. Investors built both the gross longs and shorts. The improvement in sentiment for the Swiss resulted in narrowing of net short bets by $173 million to just $16 million. Investors covered the shorts and increased the gross longs.